There's kind of a running joke in my family that it doesn't count as a real bookstore until a Kleefeld has been shopped in it. So I stopped in a new (to me) Barnes & Noble today to make sure that this particular one was official. It's kind of a chore that my family has to be the one to grant "real bookstore" status all across the country like that, but what are you gonna do, you know? At least, it's goes through my whole family and not just limited to a few of us. Anyway, so I'm looking through this Barnes & Noble for nothing in particular. But I nonetheless stop by their graphic novels section. I was struck by how small and insignificant it was. Granted, it was a larger section than any bookstore would have had, say, 15-20 years ago but it was still kind of meager looking. In fact, the Books-A-Million that I've complained about repeatedly had a much better selection than this. I did find The Art of Harvey Kurtzman on sale for less than ten bucks in the bargain section. (It retails for $45!) 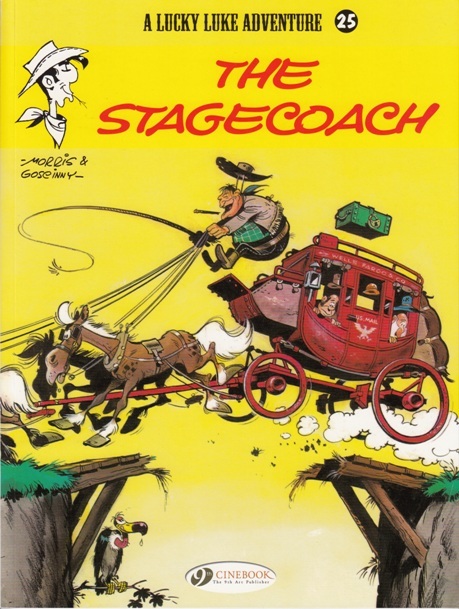 But more interestingly, I found not one but two copies of Lucky Luke: The Stagecoach. Now maybe it's just the brick-and-mortars I've happened to visit over the years, but I have NEVER seen a Lucky Luke book in English sitting on a bookshelf before. Not even in a comic shop! I've known they were printed multiple times over the years and that Cinebook has been doing new editions lately, but I've never actually seen one for sale in person! And that they had two copies is pretty suggestive that whoever ordered them didn't do so accidentally! I'm not sure what to make of it. The store didn't seem to be one of the better Barnes & Nobles I've been into, but that they've got copies of any Euro-comics at all is rather striking. Hey, I don't have that issue of "Lucky Luke"! I should check out the local B&N to see if it's a chainwide thing, or a local fluke. But, yeah, it's a great thing to see a Cinebook on the shelves, particularly one as new reader friendly as a Lucky Luke.